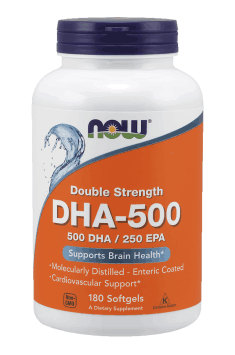 Now Foods DHA-500 is a powerful dose of essential fatty acids extracted from fish oil that does not contain poisonous chemicals (dioxins, polychlorinated biphenyls and heavy metals). The high content of DHA and EPA ensures the proper condition of the nervous, immune and cardiovascular systems. Docosahexaenoic acid (DHA) belongs to the long-chain unsaturated fatty acids that build the membranes of various cells. Its high concentration is particularly visible in the brain. It also guarantees the correct synthesis of neurotransmitters such as dopamine and serotonin. They are responsible, among others, for the feeling of pleasure, which is why they are often called ‘the happiness hormones’. Eicosapentaenoic acid (EPA) is another of the omega-3 fatty acids group that may be a precursor to DHA. Physiologically, it acts as a blocker of the phospholipase A2 enzyme, which is involved, inter alia, in the production of proinflammatory prostaglandins. It also supports the memory processes, which results in better interneuronal transmission. Cell membranes are made of so-called phospholipid bilayer, which consists of unsaturated fatty acids, giving it semi-liquidity. Their greatest concentration is in the central nervous system, where they play a double role. First of all, they are the building material for myelin sheaths that participate in the process of the nerve impulse transmission. Their improper structure results in neurological deficits, which appear depending on the location of their occurrence. In addition, DHA is involved in the synthesis of important neurotransmitter substances that regulate parameters which are important for the functioning of the whole system, such as body temperature, sleep and wakefulness, sexual tension, pleasure or motor coordination. Retina- another part of the nervous system also contains a high concentration of EFA. Their presence ensures the correct visual acuity and allows for long-lasting good eyesight. One of the more frequent disorders that occur in the cardiovascular system are the common states of increased blood clotting. They are usually formed in blood vessels that have been damaged by atherosclerotic lesions or chronically elevated blood pressure. They lead to the formation of blood clots that, when wandering with the bloodstream, can close important arteries in the heart or brain. This results in ischemia leading to a stroke or myocardial infarction. However, blood vessels can ‘defend’ against this unfavorable phenomenon by synthesizing appropriate substances that have anti-thrombotic and myorelaxant effects. One such substance is, among others, prostacyclin which is produced from the omega-3 fatty acids supplied to the body. It lowers the blood pressure and inhibits the thrombocyte aggregation. The cells of the immune system communicate with each other using substances with a parahormonal effect. They include cytokines, and derivatives of arachidonic acid - prostaglandins, as well as leukotrienes. Their production enables an effective defense against pathogenic germs, mobilizing the body's defense system to resist the intruder's attack. The problem arises at the time of overproduction of pro-inflammatory compounds which overstimulate immunocompetent cells. This leads to auto-aggression reactions and destruction of the body's own structures. To prevent such conditions, supplementation with omega-3 acids is helpful. From these acids are produced the derivatives of prostaglandins and leukotrienes with anti-inflammatory activity that regulate the immune system. This promotes the restoration of the correct response of the cells and their response to the actual threat to the system. In conclusion, Now Foods DHA-500 is a product supplementing dietary deficiencies of omega-3 acids. Each capsule contains the highest quality toxin-free fish oil, abundant in EPA and DHA acids. The preparation is recommended for anyone who wants to support cardiovascular health or cognitive functions, as well as reduce the occurrence of inflammation. The dosage of the supplement differs from the purpose of using it. The total minimum amount of omega-3 fatty acids per day should be at least 250 mg. The American Heart Association recommends doses of 1g per day, which are to include cardioprotective and protective effects on the entire cardiovascular system. The supplement should be taken with a meal containing a source of a good fat (like olive oil or avocado). Softgel Capsule (bovine gelatin, glycerin, enteric coating, water) and Natural d-alpha Tocopherol (from non-GMO soy). Rutin helps to maintain the structural integrity of blood vessels and may help to promote healthy circulation.